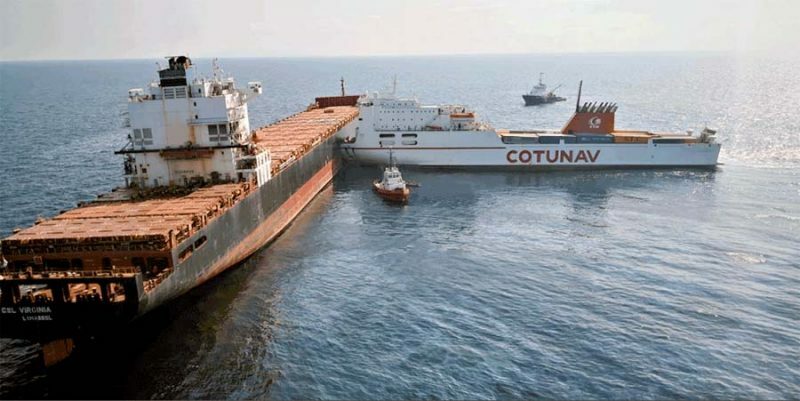 Cyprus Sea Lines’ 54,592gt/2005 built CSL Virginia was the unfortunate vessel to be ‘T-boned’ by Cotunav’s 17,097gt/1997 built Ro-Pax vessel Ulysse on 7th October as she lay at anchor about 28 kilometres north-west of Cape Corsica in the Mediterranean (above). The two ships were locked together until 11th October but the bow-shaped hole punched in the starboard side of the CSL Virginia ruptured bunker tanks and caused an oil spill that was largely contained. The Ulysse continued to Tunisia when released from the container ship and, after a total of some 3 weeks, the 5,000 TEU capacity CSL Virginia was cleared to head for dry dock at the Port of Constanta, Romania, at a speed of 10 knots. All excess fuel was removed from the ship to prevent further risk of spillage and the voyage took around 10 days. The 112,967gt/2018 built, 335m long and 10,100 TEU capacity CMA CGM Mumbai collided with the quayside at Jawaharlal Nehru Port outside Mumbai, India on 13th October, causing damage to the dock and the ship’s bow. The ship appeared to go out of control and hit the quay despite efforts to stop her. The ship operates on the FAL Asia-Europe service and was delivered on 21st May to Seaspan. The 25,431gt/2016 built Oldendorff Carriers vessel Erna Oldendorff struck the Oshima Bridge on her way to Etajima, Japan on 22nd October. The ship was moved to an anchorage and the cause of the accident was under investigation. Local reports suggested that the incident ruptured a water pipe under the bridge, leaving hundreds of local properties without water supply.